Brenda and Bob Helman had a certain lifestyle in mind when looking for a home in which to retire. 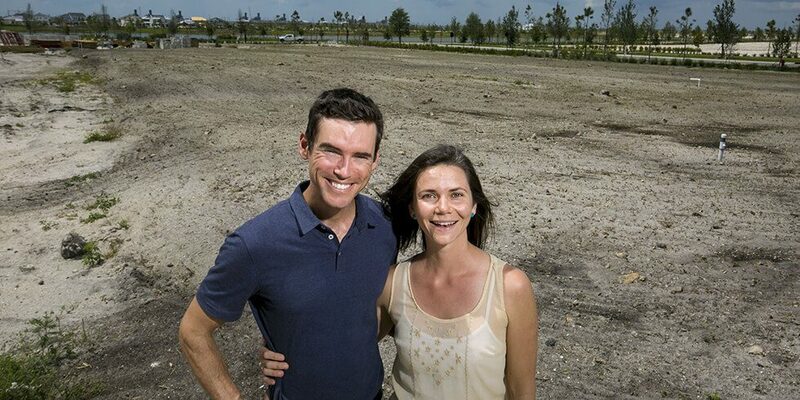 The couple hoped to move from Cooper City to a place that would be healthy, active and centrally located. They found those things in Arden, a community rising just west of Lion Country Safari on Southern Boulevard in Loxahatchee. But they also found something in Arden no other South Florida community can offer: A working farm where residents will be able to partake of the fresh produce. The neighborhood planned by Freehold Communities of Boston is one of more than 100 throughout the United States called an “agrihood,” or agricultural neighborhood. Willowsford in Virginia is one of the largest agrihoods, sitting on about 4,000 acres with a 300-acre working farm. Once completed, Arden’s farm will have a 4,000-square-foot barn and 5 acres of soil being tended by the neighborhood’s recently hired farm directors, Tripp Eldridge and Carmen Franz. The farming couple met two years ago at an agriculture conference and most recently worked together at a sprawling organic farm they helped start in Tennessee. Both started their farming careers in the Peace Corps. “We love the creative process,” Franz said of digging her hands into a new project and building Arden’s farm from the ground up. Sprouts were rising from the farm’s sandy soil on a recent Monday: Eldridge, 36, and Franz, 31, are building organic matter into the soil with a round of ground cover in the form of iron clay cowpeas and sunflowers. Another round of ground cover will follow before the farm’s “first real growing season” begins in the fall — about the same time the barn will be completed, Franz said. She added that part of her excitement in moving to Florida from Tennessee — in addition to warmer weather — comes from the diversity of crops that can be grown in the Sunshine State. “I’m obsessed with Florida’s agricultural abundance,” she said. The farm will start on a portion of the 5-acre plot, but once finished will grow vegetables, flowers, herbs and fruit trees. Eldridge and Franz also will direct events in the barn. They plan to hold workshops on organic gardening and flower arranging, farm-to-table dinners and eventually to host farmer’s markets with outside vendors. A retail space inside the barn will sell products from local vendors, including honey and olive oil, Franz said. Plans for Arden call for 2,000 homes. More than 70 homes have been sold since summer, when the neighborhood held its grand opening. A monthly $246 homeowners association fee helps cover the costs of running the farm and Arden’s 9,900-square-foot clubhouse. Bob Helman, who moved with Brenda into Arden in December, said he is excited for his family to visit once the farm is completed. “Our grand kids are going to love it,” he said.